Nucky, under jockey Eliazar Salas, setting the fastest time in Saturday's Bank of America Turf Paradise Challenge Championship at Turf Paradise. 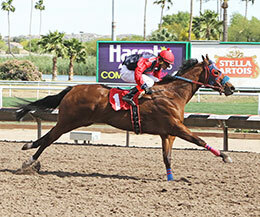 PHOENIX, AZ�APRIL 8, 2017�Facing older horses for the first time in his career, Grade 2 winner Nucky rolled to a half-length win and top qualifying time for the Bank of America Turf Paradise Challenge Championship Saturday afternoon at Turf Paradise. The 10 fastest qualifiers will return to the Arizona raceway on Sunday, April 30th to vie for the winner's share of a $55,000-added purse going the classic 440-yard distance. The winner will also earn an invite the Grade 1 $350,000 Bank of America Challenge Championship October 14th at Prairie Meadows in Altoona, Iowa. Ridden by jockey Eliazar Salas, Nucky raced over the 440-yard course in :21.523 seconds, a 105-speed index into an 18-mph headwind. The 4-year-old son of multiple stakes sire DOMINYUN was making his first start for owner Rogelio Carbajal Santos and trainer Eliazar Salas. Santos purchased the bay gelding in at the January Winter Mixed Heritage Place Sale in Oklahoma City for $62,000. Nucky showed promise early as a 2-year-old winning his first four career starts that included the Grade 2 West Texas Futurity and trials to the All American and Ruidoso Futurity at Ruidoso Downs. He went winless in six starts last season. Bobby D. Cox bred Nucky in Texas from the Southern Cartel mare Southern Brook. He has compiled a (11) 5-1-1 record and banked $113,169. Six of the ten qualifiers, including the top five, came out of the second trial race. For a complete list of Bank of America Turf Paradise Challenge Championship finalists, times, sires, dams, owners, breeders, trainers and jockeys CLICK HERE.